Mario Hoops 3-on-3, known in Europe as Mario Slam Basketball and in Japan as Mario Basket 3on3 (マリオバスケ 3on3, Mario Basuke 3on3), is a sports game developed by Square Enix and published by Nintendo for the Nintendo DS in 2006. The game is the first in which Mario and Final Fantasy characters appear together as playable characters, and the second Mario game developed by Square Enix, the first one being Super Mario RPG. It is the first Mario basketball game ever to be released, although characters from the series have appeared in the Nintendo GameCube version of NBA Street V3. The game was released on the European Wii U Virtual Console on May 26, 2016 and it was released on North American Wii U Virtual Console on November 3, 2016. The game features a series of three versus three basketball tournaments on different courts, each of three games. The game uses the Nintendo DS's touch screen extensively, and features items and coins from the Mario series. Critics praised the game for being amusing and fun, but criticized the weak AI and limited multiplayer options, with full basketball games only being playable across two players locally who each had a copy of the game. The gameplay of Mario Hoops 3-on-3 is centered on basketball games, structured into tournaments that the player must win in order to progress. The tournament ladder is made with graphics based on the original Super Mario Bros.. Each tournament consists of three games with two halves of two and a half minutes each. The one exception is an extra game with the Final Fantasy team at the end of the final tournament. The player can win a tournament by winning the three games on its ladder. Upon winning, the player is awarded either a gold cup, a silver cup or a bronze cup. These cups correspond with winning by more than 200 points cumulatively across the three matches, 100 points, or simply winning all three games. The matches feature three players on each side, with characters drawn primarily from Mario and other Nintendo games, as well as characters from Square Enix's Final Fantasy series. During matches, the Nintendo DS touch control is used for all actions except for movement, which can be handled by the directional pad. The player can also control direction via the touch screen. The top screen of the DS shows the game in 3D, while the bottom screen shows an overhead view of the whole court. Dribbling is performed automatically, but slower if the touch screen is not used actively to dribble. The player can perform multiple moves, such as stealing the ball and passing, by using gestures on the touch pad. The player shoots by drawing a line forward on the touchscreen. Depending on where the character is and how he/she is moving, the shot will either be a normal shot, a special shot or a slam dunk; these shots give the team different numbers of points. The basketball court contains multiple coin pads, which give the player coins when dribbled on up to a maximum value; when the player makes a shot, their coins are added to their total point score. There are also items which appear on the court; when used they grant the player special moves. There are two game modes: normal and hard. Hard mode is unlocked after the game is beaten on normal. In addition to the regular tournament game, there is an exhibition mode. In this mode, the player can customize the rules such as the amount of playing time, the number of periods played, and turning items on or off. Multiplayer is limited to local games, and each player must own their own copy of the game. The game does not have online multiplayer, and the "gamesharing" option (playing multiplayer across only one copy of the game) only allows for the playing of select minigames, not full basketball games. The game's music was composed and arranged primarily by Masayoshi Soken, with some tracks created by Koji Kondo and Yukio Kaneoka. The soundtrack was Soken's first major game soundtrack; he had worked at Square Enix as a sound editor for five years prior to the release of the game and had only composed music for advertisements and minor games prior to Mario Hoops. The music covers a wide variety of genres and influences, using techno, rock music, African drum beats, and vocal performances. An official soundtrack album containing music from the game, Mario Basketball 3on3 Original Soundtrack, was published by Square Enix on October 18, 2006. The album contains 31 tracks over a duration of 41:26. The game received "average" reviews according to video game review aggregator Metacritic. While the game was generally praised for its control, graphics, and variety, it was criticized for its simplistic AI, unsatisfactory minigames, and overpowered skills for the Final Fantasy characters. The lack of Nintendo Wi-Fi connection support also hurt the game. 411Mania gave the game a score of 7.5 out of 10 and said it was "a game that could've easily been rated much higher had there been Wi-Fi connectivity, smarter AI and a richer single card download-play option. Not including Wi-Fi was inexcusable as it would have easily been one of the most played games online. [...] I'd honestly recommend this game for any DS owner out there as I feel the game at least deserves a try. Some will be hooked, some won't, but you can't deny the fun of Mario Hoops 3 on 3." The Sydney Morning Herald gave it three stars out of five and called it "fast-paced stylus-swiping basketball action best suited to short matches against friends." The Times also gave it three stars out of five, saying, "The wild combinations of touch-pad and direction keys required to play make this a game you might not wish to use on public transport, and it somehow lacks the charm of previous Mario-themed games. Good, but not great." 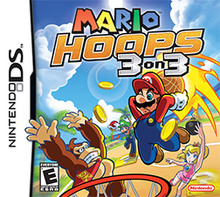 As of July 25, 2007, Mario Hoops 3-on-3 has sold 1.5 million copies worldwide. ^ a b c d e f Gerstmann, Jeff (September 12, 2006). "Mario Hoops 3 on 3 Review". GameSpot. Retrieved October 25, 2014. ^ Greening, Chris. "Mario Basketball 3on3 Original Soundtrack". Game-OST. Elvista Media Solutions. Retrieved 2015-12-02. ^ a b "Mario Hoops: 3 on 3 for DS Reviews". Metacritic. Retrieved December 2, 2015. ^ Edge staff (October 2006). "Mario Hoops 3-on-3". Edge (167): 95. ^ EGM staff (October 2006). "Mario Hoops 3-on-3". Electronic Gaming Monthly (208): 116. ^ MacDonald, Keza (October 25, 2006). "Mario Hoops 3-on-3". Eurogamer. Retrieved December 2, 2015. ^ Helgeson, Matt (October 2006). "Mario Hoops 3-on-3". Game Informer (162): 113. Archived from the original on January 6, 2008. Retrieved December 2, 2015. ^ Her Misnomer (September 13, 2006). "Review: Mario Hoops 3-on-3". GamePro. Archived from the original on October 18, 2006. Retrieved December 2, 2015. ^ Reilly, Mike (September 22, 2006). "Mario Hoops 3-on-3 Review". Game Revolution. Retrieved December 2, 2015. ^ Villoria, Gerald (September 13, 2006). "GameSpy: Mario Hoops 3-on-3". GameSpy. Archived from the original on October 18, 2006. Retrieved December 2, 2015. ^ "Mario Hoops 3-on-3 Review". GameTrailers. September 21, 2006. Archived from the original on June 28, 2008. Retrieved December 2, 2015. ^ Kolan, Patrick (October 30, 2006). "Mario Hoops 3-on-3 Aussie Review". IGN. Retrieved December 2, 2015. ^ Burman, Rob (February 9, 2007). "Mario Slam Basketball UK Review". IGN. Retrieved December 2, 2015. ^ Harris, Craig (September 12, 2006). "Mario Hoops 3-on-3 Review". IGN. Retrieved December 2, 2015. ^ "Mario Hoops 3-on-3". Nintendo Power. 209: 85. November 2006. ^ a b Hill, Jason (October 14, 2006). "Mario Hoops 3-on-3". The Sydney Morning Herald. Retrieved December 2, 2015. ^ Aranda, Ramon (September 22, 2006). "Mario Hoops 3 on 3 (DS) Review". 411Mania. Archived from the original on December 8, 2015. Retrieved December 2, 2015. ^ Casamassina, Matt (July 25, 2007). "Nintendo Sales Update". IGN. Retrieved December 2, 2015.